This was so much fun!! My family wants to do another one now! It is a great activity, takes teamwork and a lot of puzzle solving! A 70s murder cold-case has been reopened due to recent incidents which match the killer’s M.O.. 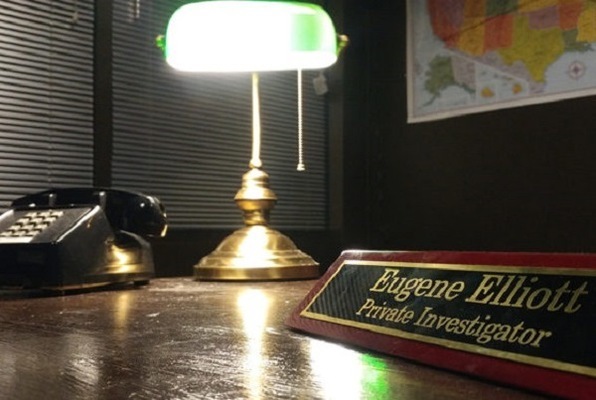 Private investigator Eugene Elliot has been reassigned to the case and needs your help. You and your team of investigators must discover the killer’s identity before he strikes again. Reviews of escape game "Private Eye"
I did both rooms back to back with family and friends. We all enjoyed both rooms and our collective favorite was Private Eye. The puzzles were just overall better thought out than Professor White. Each room had some great puzzles that I haven't seen and really liked. And most of them kept on theme the whole time. The difficulty isn't that bad but it is perfect for my normally failing group haha. Thanks for the great night! We tried both of the rooms that they had available, and had an absolute blast in both. The first one we didn't complete in time, but got very close! And the second one we managed to get through. They do a really good job of making the experience totally immersive, and you get lost in the experience (in a good way). We will definitely be keeping an eye out for new rooms from them!